Greeting Card Happy Birthday Piano/Notes.. This 7 x 5 in. Happy Birthday Card features a Piano design and is part of the big range of musi.. This 7 x 5 in. Happy Birthday Card features a Guitar design and is part of the big range of music gi.. 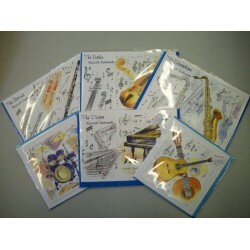 This lovely greeting card is bound to bring a smile to the face of the musician in your life. Blank .. This 7 x 5 in. Happy Birthday Card features a Violin design and is part of the big range of music gi..
Greeting card Tempo di Valse A6 Vienna World..